Fiber's bulk helps you feel full sooner, so you may eat fewer calories during that meal. Fiber-rich foods digest more slowly, so you stay full longer. Foods high in fiber don't spike your blood sugar. Such spikes make you get hungry again quickly. It shouldn't surprise you, then, that many of the high-fiber foods are also on the 15 fat-burning foods list. Adults should aim to eat 25 to 30 grams of fiber per day. Food groups highest in fiber include breakfast cereals, fruits, vegetables, beans & peas, and whole grains. I've provided you with a high fiber foods list for each of those food groups below. I didn't include every possible fiber-rich food. But there are enough high-fiber foods in each high fiber foods list to give you a good idea of the types of food you can look for at the grocery. 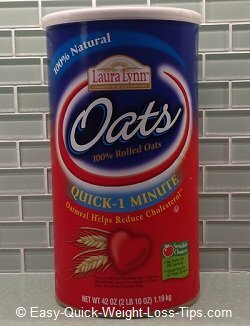 Instant Oatmeal (various brands) - I usually add raisins, low-sugar protein powder, Stevia, and soy milk to my 1-minute quick oats. It's a fast, cheap breakfast that provides me steady energy all morning. Other cereal brands are also high in fiber, so you have a lot of options. A huge pitfall to avoid is cereals loaded with sugar. Read the label, checking for both fiber AND sugar content. Extra sugar calories will just make you fatter! Eat fruit with the skin on when appropriate (apples, for example). The skin is an excellent source of high-quality fiber. A convenient but more expensive way to eat more fruit is to buy dried fruit. Raisins are often easy to find, but there are others. Dried fruits I've found at my local grocery store include dried apples, apricots, cranberries, plums, and mangos. Although dried banana chips are quite tasty, you might want to limit the number of bananas you eat. It's my understanding that bananas have a high glycemic index rating, meaning they can raise your blood sugar significantly. You may have noticed that lettuce, kales, and other leafy vegetables didn't make this high fiber foods list. Those veggies are sources of fiber and considered roughage, but on the lower end of the scale (2 grams of fiber or less per serving) according to the sources I consulted. Look for dried vegetables in the dry goods section of your grocery store. Often you can buy them by the pound. 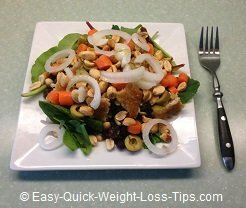 Dried veggies are not cheap, at least in my area, but they're certainly a option if you need to add more fiber to your lunch or as a snack. Wasabi peas! 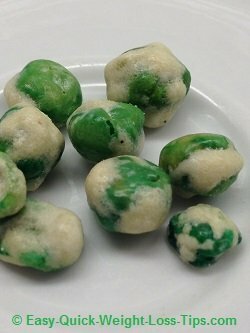 Dried green peas with a crust of hot Japanese wasabi sauce (similar to horseradish). If you enjoy spicy foods like I do, wasabi peas are a high-fiber, addictive snack. Another excellent high-fiber snack is dried salted edamame, which tastes like salted peanuts. Dried soynuts are yet another high-fiber snack. And if you don't like the taste of certain types of beans and peas, hide them in a salad. That's what I do. I've compiled whole grains into another high fiber foods list. 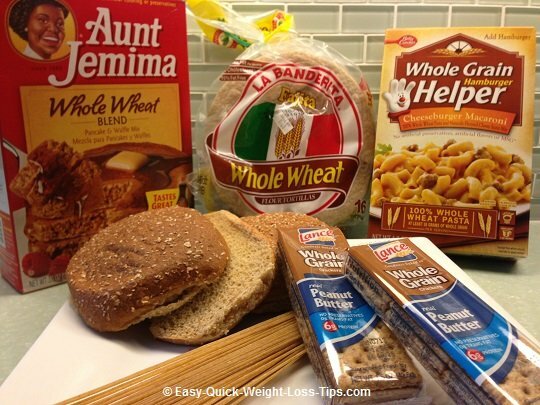 The following whole grain foods provide a respectable 6g or more of fiber per serving. Barley - grits, flour, or whole barley (also known as barley pearls), especially early in the day. You can even make your own barley cereal. Whole-wheat pancakes - with sugar-free syrup on top, yum! Remember, you don't have to eat all the fiber-rich foods listed above. 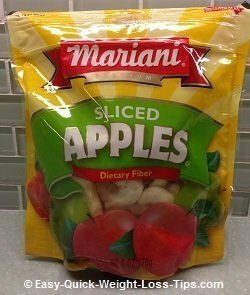 Just set a goal to increase the amount of fiber in your diet. Start by eliminating low-fiber junk foods. Get the junk food out of your house - seriously. Next, replace other low-fiber foods you may be eating with high-fiber, healthy foods. For example, if you normally eat white bread, switch to 100% whole wheat bread. Then, begin adding one or two foods from each high fiber foods list to your weekly meals. 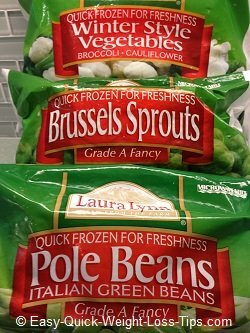 You know, foods you normally might not eat like green beans or brussel sprouts. Improve the flavor with healthy condiments & seasonings. Add a side-salad to your evening meal, and load it with sliced and diced vegetables. Periodically I'll even have a large salad as my evening meal. A note of caution: Be careful when adding food from a high fiber foods list to your normal diet. Too much fiber can lead to unpleasant effects like intestinal gas and bloating. The body can often adapt, but check with your doctor if necessary to be sure you're not overdoing it. If you are addicted to the taste of sugar and fat, the foods on these high fiber foods lists may seem bland. Experiment with recipes and continue to eat them anyway. Be patient! You really can teach your taste buds to enjoy high-fiber, low-sugar foods, and healthy foods in general. That's been my experience, anyway. University Of California Davis. "Increased Fiber Curbs Appetite In Women." ScienceDaily, 1 Nov. 2002. Web. 2 May 2013. There is mounting evidence that eating more soluble fiber [such as vegetables, fruits, and beans] reduces visceral or belly fat. Society for Endocrinology. "Scientists Discover Why a Low GI Meal Makes You Feel Full." ScienceDaily, 18 Mar. 2009. Web. 2 May 2013.